Apple's $69 Magic Trackpad ( ) is a standalone, Bluetooth trackpad that uses the same glass surface as the trackpad on Apple’s MacBook Pro laptops. If you're a Mac laptop user who has become comfortable with multi-touch trackpad gestures, the Magic Trackpad will have some serious appeal. But if you've got a large display, you may find that it's hard to cover that ground with just a trackpad. The Magic Trackpad is also a good match for Apple's current wired keyboards: The thicknesses and inclinations are nearly identical, so when you align the front edge of the trackpad with either of Apple’s wired keyboards, the top surfaces align almost perfectly, although the trackpad’s battery compartment of course extends beyond the rear edge of the wired keyboard. 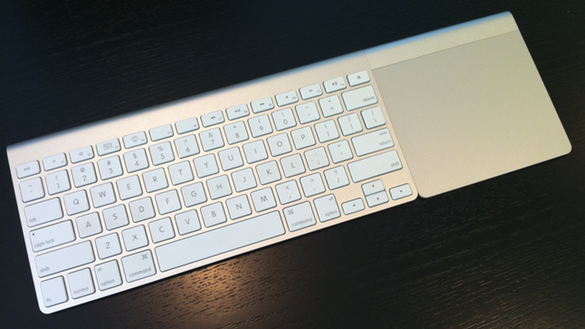 One place the Magic Trackpad doesn't sit especially well is on your lap with a keyboard. If you're using Apple's Wireless Keyboard with, say, a Mac mini in your home entertainment system, you'll likely wish for a version of the keyboard with the trackpad permanently attached. I suspect it won't be long before an enterprising third party announces a convenient tray that holds the Wireless Keyboard and Magic Trackpad together. Apple claims the Magic Trackpad is nearly 80 percent larger than the largest MacBook Pro trackpad, making the Magic Trackpad the largest trackpad the company has ever made. The actual trackpad surface is roughly 5.2 inches wide by 4.3 inches deep; the entire device, including the battery compartment, is 5.2 inches deep. My favorite Magic Trackpad design feature is the feet. The feet? Yes, the feet. While the Magic Trackpad may not appear to support physical “clicking,” it indeed does: The two nubby, rubber feet on the bottom, along the front edge, actually have a button built into them. When you press down on the trackpad surface, the feet “click,” giving you the same tactile sensation as you get with Apple’s current MacBook trackpads. Very clever, and a welcome Apple touch—no pun intended—for those who hate touch-tapping. The Magic Trackpad ships with two AA alkaline batteries. However Apple now also sells its own Apple Battery Charger, complete with six rechargeable batteries—enough to power a Wireless Keyboard, Magic Trackpad, and Magic Mouse simultaneously. Apple hasn’t published an official battery life for the Magic Trackpad—the company has said only that the Magic Trackpad goes into a power-saving mode when not being used in order to extend battery life—but after two days of solid use, the battery indicator in Trackpad preferences still reads 100%. Despite its large size, the Magic Trackpad doesn't function as a drawing tablet out of the box. However, Ten One Design says that its $25 Inklet utility will add that functionality to the Magic Trackpad shortly. If you're looking for an input device that acts as both a Multi-Touch trackpad and a drawing tablet right out of the box, you should consider Wacom's Bamboo Fun and Bamboo Pen & Touch. There's also a Bamboo Touch model that lacks tablet features, making it an interesting alternative to the Magic Trackpad for those who prefer dedicated buttons—the Bamboo Touch has four large ones. After pairing the Magic Trackpad with your Mac—the process is quick and easy—and installing the required software update, you configure the trackpad’s gestures using the Trackpad pane of System Preferences, just as you would the trackpad on a MacBook. 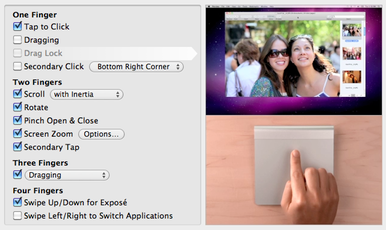 (This pane also displays the Magic Trackpad’s battery level and provides a helpful video demonstration of gestures.) For most gestures, your choices are simply whether or not the gesture is enabled, although a few give you more options. For example, you can choose whether or not to use one of the trackpad’s bottom corners as a right-click, and if so, which corner. The available gestures—also helpfully displayed on the back of the Magic Trackpad’s box—are identical to those you can use on a MacBook: besides moving the cursor, you can click, right-click, double-click, click-drag, two-finger scroll, two-finger rotate, two-finger pinch and zoom, two-finger screen zoom, three-finger swipe, and four-finger swipe. It's also worth noting that if your Mac has an exceptionally large screen, or if you have multiple displays connected, the Magic Trackpad requires a bit more effort than a mouse, and especially a trackball, when moving the cursor across that expanse. With a mouse or trackball, you can "fling" the cursor across the screen, or even across multiple screens, to access items that aren't currently near the cursor. But a trackpad moves the cursor only when you're actually sliding your finger across the trackpad's surface, so the Magic Trackpad often requires multiple drags to get from one side of a large desktop to the other. The new trackpad software also adds a couple new gesture options, both to the Magic Trackpad and to most recent Apple laptops. The first is that you can now opt for scrolling with inertia, which gives your scrolling documents and windows a bit of virtual momentum—when you lift your fingers off the trackpad while swiping, instead of the scrolling movement coming immediately to a halt, it gradually slows down until it eventually stops. This is a great feature I've been raving about for years—first when it debuted with Logitech's Precision Scroll Wheel and later when Smart Scroll made it available to all input devices. I'd love to see similar inertia when moving the cursor, which would help with the issue I noted in the previous paragraph. The other new option is that the three-finger gesture, which previously could be used only to navigate—to turn pages, flip through photos, or switch Safari tabs, for example—can now instead be used as a substitute for click-drag. (This option isn’t available on the MacBook Air and on Early 2008 MacBook Pro models.) Using this new gesture takes some practice, but I often found it to be more convenient than the traditional click-drag approach. However, the three-finger click-drag is not very useful if you need to move an item across a large swath of screen real estate—as soon as you lift your fingers to reposition them, you "drop" whatever item you're dragging. I also regularly wished I could somehow use both the new click-drag and the original three-finger-swipe gestures at the same time—whichever I activated, I inevitably found myself in a situation where I wished I could use the other. If Apple's gestures aren't enough for you, you're not out of luck. The latest alpha version of the third-party trackpad utility BetterTouchTool provides support for the Magic Trackpad, giving you many more possible gestures, and letting you assign custom actions to any of those gestures. The similar utilities MagicPrefs and Jitouch were not yet compatible at the time we posted this article, although I suspect their developers will be updating the software soon to work with the Magic Trackpad. If you're a big fan of the Multi-Touch trackpads on Apple's current laptop models, and you've ever thought to yourself, "I wish Apple would make a trackpad for my desktop Mac," the Magic Trackpad is for you. It gives you the same clickable, glass surface, with the same Multi-Touch gestures, as those laptop trackpads in a wireless desktop model—with the added bonus of nearly twice the trackpad area. The only real caveat is that if you've got an exceptionally large display, or multiple displays, you may find the Magic Trackpad requires more effort to traverse that screen area than a trackball or mouse. On the other hand, if you're the type of MacBook user who prefers a mouse or trackball over the built-in trackpad—say, for reasons of ergonomics or precision movement—the Magic Trackpad probably won't win you over. It's the same trackpad, just bigger.